KA-BAR USMC Part Serrated Knife with Leather Sheath | BUDK.com - Knives & Swords At The Lowest Prices! The most famous knife in the World gets updated with a serrated edge to easily cut synthetic and looped materials. Hey, you get what you pay for ... and this knife is no exception. Genuine American-Made quality. Full tang, thick blade, sharp outta the box. Heavy leather sheath w/metal rivets. This knife will earn nothing but respect hanging from my belt. Love it! Thanks, BudK! this knife is great it is very sharp. a little heavier then hope for but over all great. This knife is AMAZING. I bought this knife for self defence, camping, around the house use, and things like that. it is wicked sharp, and very well made. Rather your wanting a knife to practice and throw, or a knife to really USE (camping, and things that would be ruff on the knife) this is a MUST BUY. 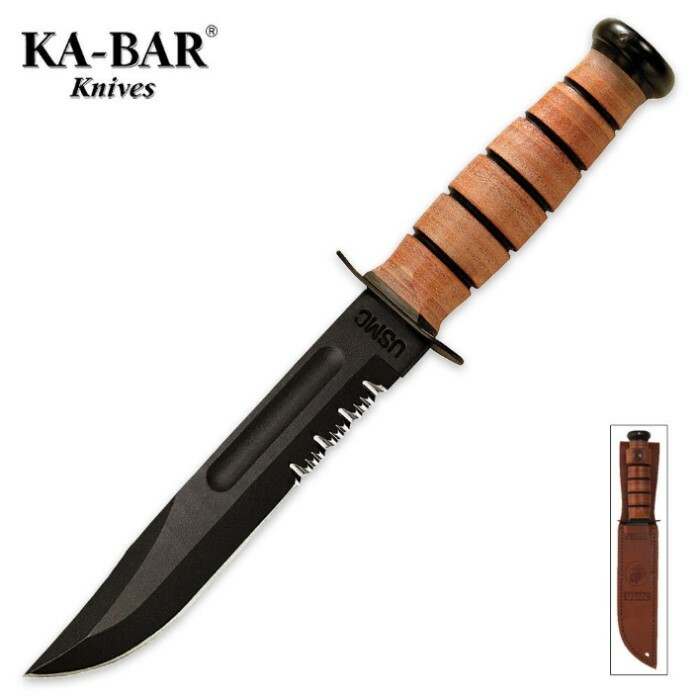 As you should know, KA-BAR makes some of the best knives in the world, and this is one of the great ones. I bought this knife thinking it would be awesome having an awesome knife like my friend in the Corps. It came really sharp, it's durable, and it's big, really big. The full tang edition feels very firm and stable. The only flaw in this is that my sheath won't close, the snap on it doesn't go all the way around the handle. Either way it's a great knife for outdoors, camping, stabbing things, self-defense, revolutions.